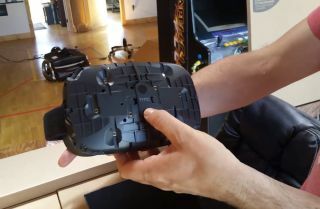 Valve began shipping SteamVR Developer Edition kits to developers this week, according to a post from Valve’s Chet Faliszek in the SteamVR community forums. The SteamVR Developer Edition includes the Vive headset, 2 Lighthouse base stations, a pair of wireless SteamVR controllers, and cables and instructions to go along with the hardware. Want to see what all that stuff looks like? You’re in luck! Developer Cloudhead Games put up an unboxing video to show off their new dev kit. As you can tell from a comparison to earlier photos, the headset looks a bit different from its prototype form shown at GDC.